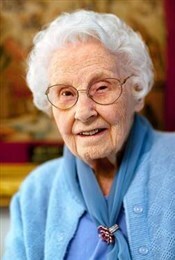 Let us remember with thanksgiving the life and ministry of Edith Mae Grogan Hansen, 101, who died on January 10, 2017 in Durham, NC. Edith was the widow of Rev. Wilfred Hansen who served the New York East and New York Conferences for 50 years. Edith Hansen was born in Manhattan, NY and grew up in Richmond Hill, Queens. She graduated from Jamaica High School in 1930 at age 15. In 1934 she began nursing training at St. John’s Hospital in Brooklyn, NY, graduating in 1937. In 1938 she married Rev. Hansen. In the early years of his ministry Rev. Hansen served several churches on Long Island: Bellport-Brookhaven, Bensonhurst, Queens Village, South Floral Park, and Islip. He also served churches in New Britain, CT and Stratford, CT before being appointed district superintendent of the New Haven District (later the CT Central District) from 1963 to 1969. He then served nine years at Baldwin UMC on Long Island and one year at Round Hill UMC in Greenwich, CT.
Edith enjoyed being a minister's wife and valued the fellowship of those in the churches at which her husband served. Rev. Hansen retired in 1979, but continued in ministry for nine years as associate pastor of Golden Hill UMC in Bridgeport, CT. He died on November 11, 1996. Edith’s favorite activity was keeping up with friends and family. She also enjoyed numerous avocations, including sewing clothes, making crafts and raising African violets. She became an expert at making fruit cakes and decorating wedding cakes, all of which she shared with family and friends. In 2003, Edith moved from Connecticut to Durham, NC to be near her daughter. She enjoyed the last 13 years at the Croasdaile Methodist Retirement Community, where she made wonderful friends. She was always grateful for the wonderful care she received from the Croasdaile staff. Edith is survived by three children: Wilfred J. Hansen and his wife, Susan, of Pittsburgh, PA; Joann Haggerty and her husband, Jack, of Chapel Hill, NC, and Meg Carpenter and her husband, Bill, of Bothell, WA. Edith especially adored her five granddaughters, one grandson and six great-grandchildren, as well as numerous other loving family and friends near and far. Edith's loving personality will be greatly missed. In lieu of flowers, memorial contributions can be made to the American Heart Association. Blessings and prayers to the Hansen family at this time of loss.